Alongside Bach and Handel, Vivaldi is one of the most famous and celebrated of composers from the Baroque Period. He was born in Venice at the time when the city was the capital of an independent state called the Republic of Venice. His father was a musician in the prestigious St. Mark's Cathedral, and taught the young Antonio to play the violin at a young age. The violin was to be a key instrument for Vivaldi as both performer and composer. Like his father and other members of his family, Vivaldi had red hair and, when he was ordained into the priesthood at the age of 25, he was given the nickname "The Red Priest" (Il Preto Rosso) for this reason. However he suffered from what is thought to have been asthma, and because of this he was not required to fulfil the normal duties of a priest. Instead he was assigned to an orphanage called "The Devout Hospital of Mercy" (Conservatorio dell'Ospedale della Pieta) which was one of several institutions in the area with a strong emphasis on musical education. His role there was initially master of the violin, and he was to remain with the Pieta for more than 30 years. The post was overtly a teaching position and Vivaldi taught and coached the girl orphans, the most talented of whom performed in the establishment's orchestra and choir. There were also boys at the orphanage, but their education concentrated on learning a trade and they generally left to become apprentices at the age of 15. In addition to teaching he also composed music to be played by the school's orchestra and choir, and he also performed with them. His fame spread across Venice, Italy and Europe, helped in part by the publication of some of his works. His growing reputation as a violinist and composer gave him a degree of independence from the school. Provided he continued to compose for them, he had the freedom to accept other commissions and to travel to other artistic cities in Europe to play and promote his music. Vivaldi was later promoted to the post of Music Director of the Institution. In later life having retired from the orphanage, his fame diminished and like a number of other composers, he died a pauper and was buried outside of the city walls. Vivaldi's music had fallen somewhat out of fashion, and it wasn't until a revival of interest in Baroque music during the 19th Century that his name and some of his works became better known by composers of the day. Vivaldi's strongest revival with concert audiences did not come until the 20th century when many more of his scores were released from a private hands, and his "Four Seasons" became firmly established as a popular favourite. Music from these concertos was used extensively in the TV Series "Casanova" shown in 1971 set in Venice (a few decades after Vivaldi's death) and starring Frank Finlay in the title role. The music was again used in the 1981 romantic comedy movie "The Four Seasons" written by and starring Alan Alda. 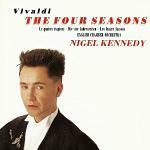 In 1989 Nigel Kennedy released his interpretation of The Four Seasons, generally faster-paced than previous recordings, and this album sold more than 2 million copies making it one of the most successful classical recordings ever. Vivaldi composed a number of Operas and liturgical works for his employers, but it is primarily as a composer of Concerti that he is best known. He took the established Concerto form of the day, with a solo instrument supported by a string orchestra (possibly with other instruments) playing recurring "ritornello" passages. He made the Concerto more playful and flamboyant, giving the soloist more of a starring role as a virtuoso, and expanded the accepted forms of interplay between the solo and orchestral sections. His slow movement (the middle of 3 movements in the traditional concerto) were also expanded in a way similar to the arias of his operas. All these innovations were to lead directly into the Concerto as we know it from the Classical Period, where the form was frequently used by composers such as Mozart and Beethoven. Vivaldi himself was influenced by the dominant forms performed in Italy at the time, especially the music of Corelli. Vivaldi himself has been criticised because many of 400+ concertos were predictable in style, but some of these concertos clearly demonstrate the composer's willingness to indulge in experimentation and innovation. Some of his concertos are clearly programmatic in nature, meaning that they tell a story in music. His Four Seasons is an obvious example because they contain storms, bird calls, and other evocative events that help to convey the different moods of the 4 seasons of the year. These programmatic notes have been written into the relevant parts of the score, so the composer's intention are very clear. Some of his other concertos for Violin and Flute are also programmatic. On mfiles you can find the full music for the 3rd of these concerti, Autumn in full score and with all the parts. Like most concertos this is in 3 movements, and the work is also available in midi and mp3 formats. We also have an arrangement of Autumn for Violin and Piano also complete with parts and audio files, and an alternative arrangement of Autumn for Piano Solo. Given that the composer died 270 years ago, you would think that we would know as much about Vivaldi's music as we are likely to know. 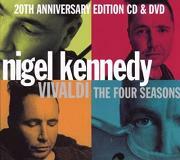 However in two separate incidents just weeks apart, new music by Vivaldi has been discovered. 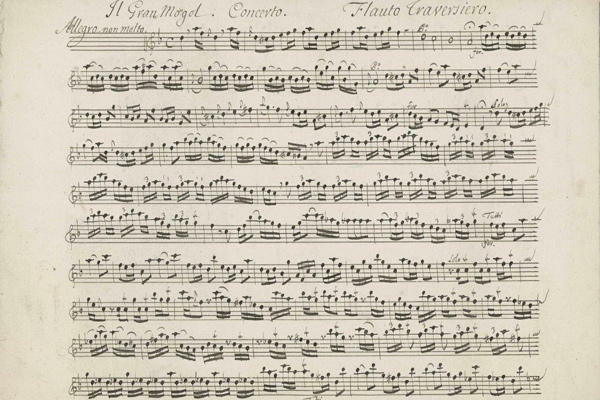 Firstly, a researcher uncovered a Vivaldi score when searching through papers in the National Archives of Scotland. It turned out to be the only known copy of a Flute Concerto called "Il Gran Mogol" (The Great Mogul). This is one of a set of 4 Concertos based on Nationalities - "Il Gran Mogol" refers to India then ruled by the Mogul Emperors, and the others are "La Francia" (France), "La Spagna" (Spain), and "L’Inghilterra" (England). The Flute Concerto was virtually complete and here is the opening from the solo flute part - image: National Archives of Scotland. The second incident was the discovery in the Foundling Museum in London of 2 previously unknown Vivaldi violin sonatas. Vivaldi often grouped his concertos into sets. For example, the Four Seasons are actually the first 4 of a set of 12 concertos called "Il cimento dell'armonia e dell'inventione" (The Contest between Harmony and Invention), while a previous set of 12 violin concertos were call L'Estro Armonico (Harmonic Imagination). In general Vivaldi's concerto groups have Opus numbers, while individual works within the group or standalone works are identified by RV numbers (after Peter Ryom, a Danish scholar who catalogued the works). 12 Concertos, Op.8 - The Contest Between Harmony and Invention (Il Cimento dell'armonia e dell'inventione) - Nos.1-4 are the Four Seasons: No.1 in E, RV269 Spring (La primavera); No.2 in Gm, RV315 Summer (L'estate); No.3 in F, RV293 Autumn (L'autunno); No.4 in Fm, RV297 Winter (L'inverno); No.5 in Eb, RV253 The Sea Storm (La tempesta di mare); No.6 in C, RV253 Pleasure (Il piacere); etc. 6 Concertos for Flute and strings, Op.10 - No.1 in F, RV433 The Sea Storm (La tempesta di mare) though different from the violin concerto of the same name; No.2 in Gm, RV439 The Night (La notte); etc. Sonatas - several for solo cello, several for solo violin, several for solo flute, several for 2 violins, and some examples for other instruments and combinations including recorder, oboe, bassoon, etc.